Have you spotted a black bear in your backyard this spring? Or maybe on the bike path? It can feel like a close encounter, but state wildlife biologists have been getting much, much closer. Dave Wattles, MassWildlife black bear and furbearer project leader, and members of his team visited the dens of 19 hibernating female bears during the months of February and March in central and western Massachusetts, discovering mother bears in good shape and high survival rates for their cubs and yearlings. 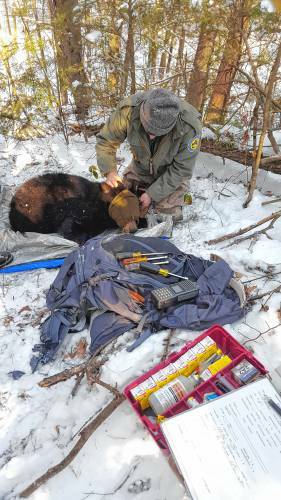 Now, the researchers are giving black bears another good bill of health at the close of their annual winter den checks. 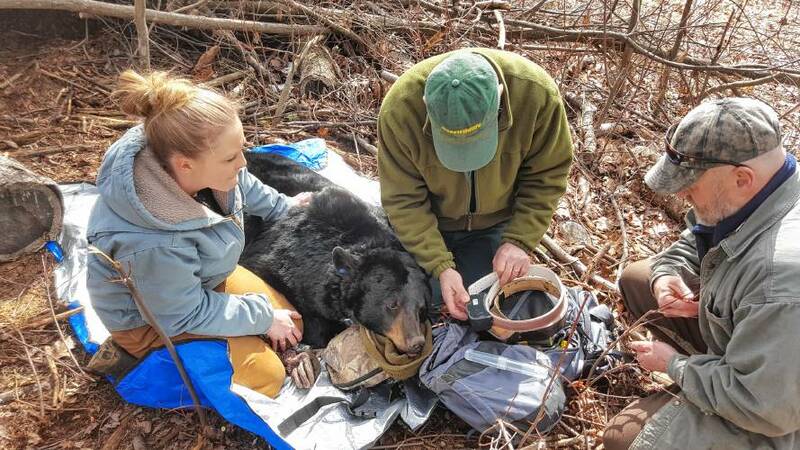 The bears are part of an ongoing research program that has been in operation for 39 years and that Wattles says has allowed MassWildlife to develop strong data on the survival and reproduction of black bears in the state. 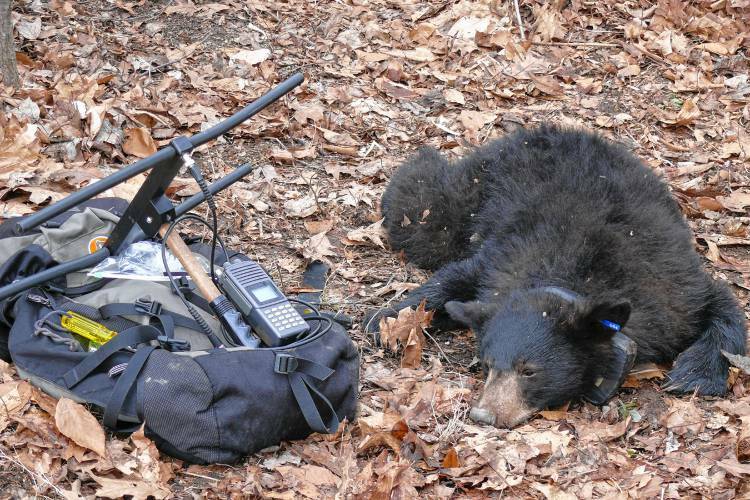 Using radio telemetry and GPS navigation, the research team tracks sows, or female bears, previously fitted with transmitter collars to their dens, which can be located in a variety of places, typically in brush piles, under fallen trees, in rock crevices and in tree hollows. In more suburban areas, collared bears have been known to den in backyard woodpiles and under decks, as these spots are not frequently visited by people during the winter. But the bear dens are not often in plain view and can be difficult to reach. 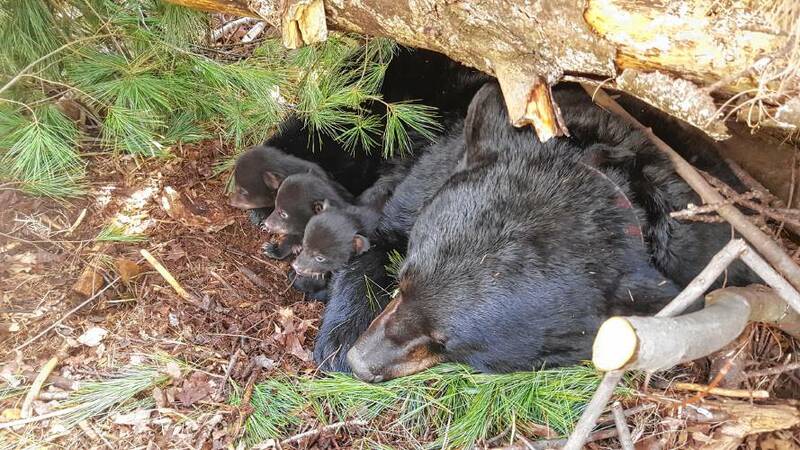 One bear with yearlings — which the team ultimately decided not to handle — had denned in the hollow of a tree 25 feet off the ground. Bears that are not checked on in their winter dens will be tracked later in the spring to assess their status. Once the den is located, biologists use a jab stick — a pole with a syringe on the end containing Telazol — to immobilize the sow in the den. It is the same drug used by veterinarians to anesthetize dogs and cats. 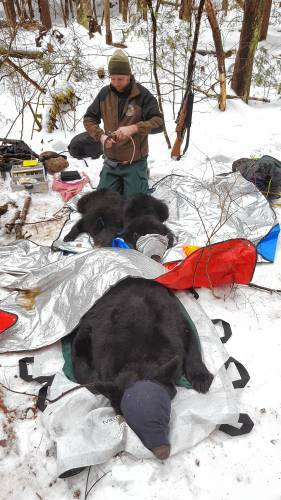 After the bear is tranquilized, she is carefully removed from the den, and her vital signs are continuously checked and monitored. As the bears are unable to blink when drugged, an ophthalmic ointment is placed in each eye, and a protective covering is placed on the head to keep dirt from getting into the eyes. The team then fully documents the condition of the bear. “We will assess the body condition, get a weight and try to see what they have for muscle and fat reserves,” Wattles said. Sows are weighed by being placed in a net attached to a spring weight scale and suspended from a horizontal pole supported by team members. 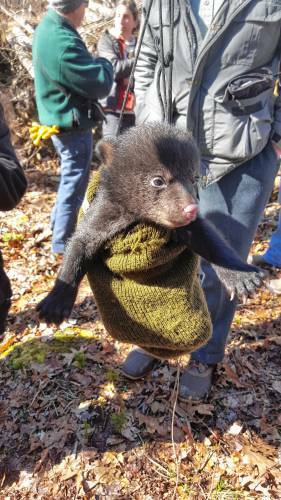 If cubs are present, they are carefully removed, counted, sexed, weighed, given a general health assessment and kept warm while other team members attend to the sow. Yearlings that are present are also immobilized, and females are fit with expanding collars, to start their documentation in the study. Black bears mate from mid-June to mid-July and give birth to tiny cubs in mid-to-late January during hibernation. Bears have a unique survival strategy called delayed implantation. After mating, a group of cells or a blastocyst is formed but does not immediately get implanted in the uterus. Instead, it remains dormant until the female has gained enough weight to survive the winter and sustain her cubs. If this does not occur, the blastocycst will be absorbed and there will be no pregnancy. Cubs will remain with their mothers for about 17 months, during which time the mothers teach them how to forage and escape from harm, among other important survival skills. Black bears are able to reproduce at 3 years old but, many young inexperienced bears are unsuccessful at raising their first or second litters. Young mother bears tend to have fewer, smaller and less robust cubs. They will often roam throughout their range with their cubs in tow, exposing them to various dangers along the way. Wattles added that females get the hang of how to successfully raise cubs at around 5 or 6 years old. “In her prime, at about 6 years old, a mother bear can produce two to four cubs. That number decreases into her late teens,” he said. 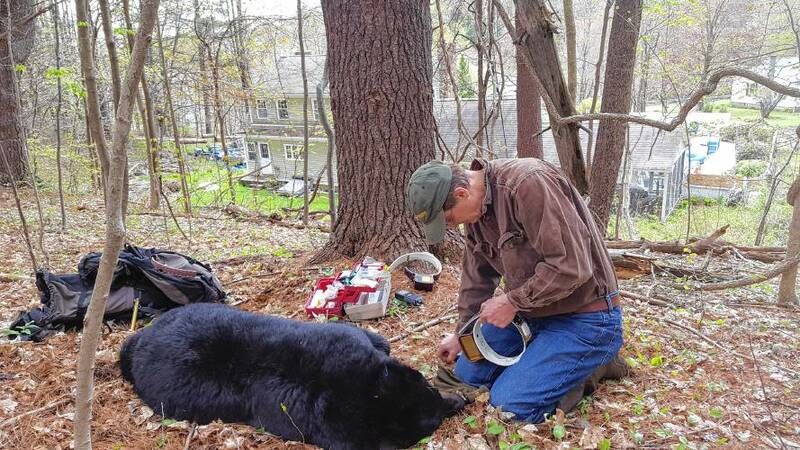 By studying black bears, biologists can track survival rates, the causes of mortality, reproduction trends, how bears are using and moving through their habitat, and how food availability affects their health and survival. MassWildlife will be implementing a new study this spring using hair snares. This involves stringing barbed wire in certain locations and baiting that area. When bears pass under the wire, their fur is caught on the barbs and then collected for DNA study. With the black bears’ thick layer of fur, the barbs don’t come close to their skin. 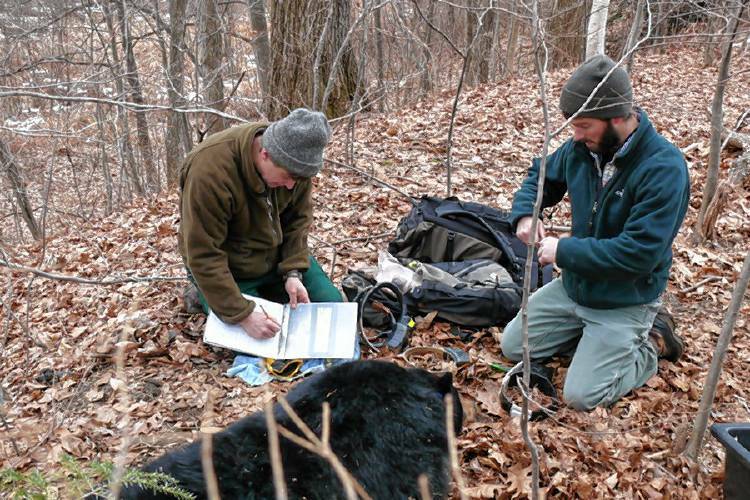 The new study will allow biologists to look at the genetics of the bear population, giving them yet another tool to better understand black bears in Massachusetts.